CANTON, MA (June 7, 2013) – Today, June 7, is National Donut Day, and Dunkin’ Donuts, America’s all-day, everyday stop for coffee, donuts and baked goods, is marking the holiday with special treats for everyone. First, Dunkin’ Donuts is treating guests to a delicious, free donut of their choice (while supplies last) with the purchase of any beverage. The offer is good all day today at participating Dunkin’ Donuts restaurants nationwide. To help guests all around the world celebrate the joy of donuts, Dunkin’ Donuts is also making this special offer available in its restaurants across the globe. Dunkin’ Donuts today also officially introduced the Glazed Donut Breakfast Sandwich as a permanent addition to the brand’s menu. 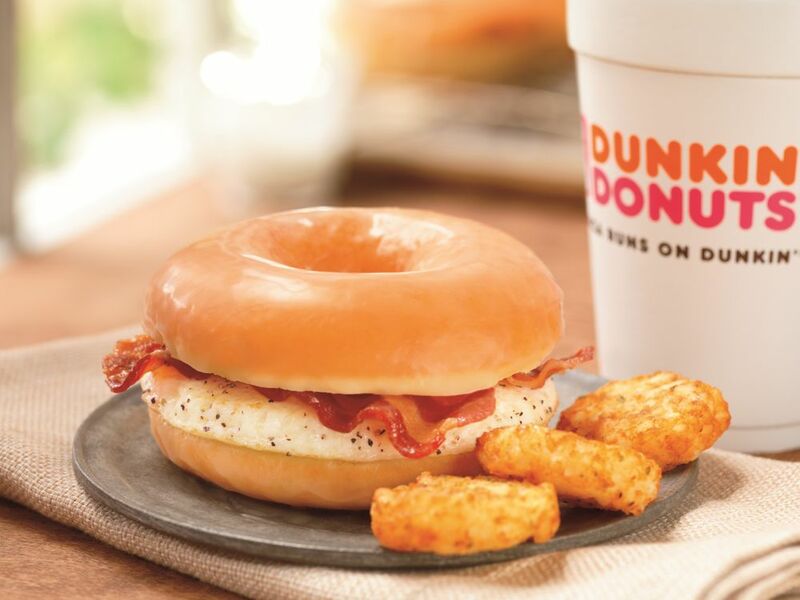 At only 360 calories, this unique sandwich features a fried egg and two slices of bacon between a sliced glazed donut, bringing together a classic bacon and eggs breakfast with the sweet taste of Dunkin’ Donuts’ beloved glazed donuts. The new sandwich is available at participating Dunkin’ Donuts restaurants throughout the U.S. Earlier this week Dunkin’ Donuts also unveiled new Summer Fruit Donuts to celebrate the season. Dunkin’ Donuts’ new Summer Fruit Donuts are available in two fun fruit flavors: Lemonade, featuring a yeast shell, lemon filling, white dipping icing and lemonade bark topping; and Key Lime, featuring a yeast shell, key lime filling, white dipping icing and graham cracker topping. Both new donuts are available through August at participating Dunkin’ Donuts restaurants nationwide. Finally, Dunkin’ Donuts is also celebrating on Twitter, with the National Donut Day Twitter Sweepstakes. Today, followers of @DunkinDonuts on Twitter will be presented with the name and image of a half-dozen of the brand’s innovative donut creations from around the world. Fans who enter a guess as to the country where the donut is available, using the special hashtag #DDonut, will be entered for a chance to win a $100 Dunkin’ Donuts mGift. Dunkin’ Donuts will award a total of six $100 Dunkin’ Donuts mGifts throughout the day. For official rules and additional information related to the National Donut Day Twitter Sweepstakes visit: http://www.dunkindonuts.com/content/dunkindonuts/en/promotions/national_donut_day_sweeps.html. “National Donut Day is a perfect opportunity to connect with our fans and celebrate the many ways donuts make any moment in a busy day much sweeter,” said John Costello, President, Global Marketing and Innovation at Dunkin’ Brands. “As the donut leader we are excited to make this day special with a free donut with a purchase of a beverage, along with the launch of our innovative Glazed Donut Breakfast Sandwich, and chances all day to win Dunkin’ Donuts mGifts on Twitter,” he said. National Donut Day, held the first Friday of June each year, was originally established in 1938 by the Chicago Salvation Army to honor women who served donuts to soldiers during World War I. Dunkin' Donuts has led the donut category for more than 60 years, selling approximately 2.4 billion donuts and MUNCHKINS® donut hole treats combined globally per year. Dunkin’ Donuts throughout the United States offers more than 70 varieties of donuts, including beloved flavors such as Boston Kreme, Glazed and Chocolate Frosted.